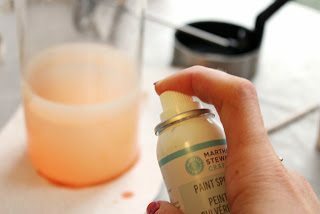 I recently got to try out the Martha Stewart Glass Paint line from Plaid Crafts before it hit shelves, and I’m a little bit in love. 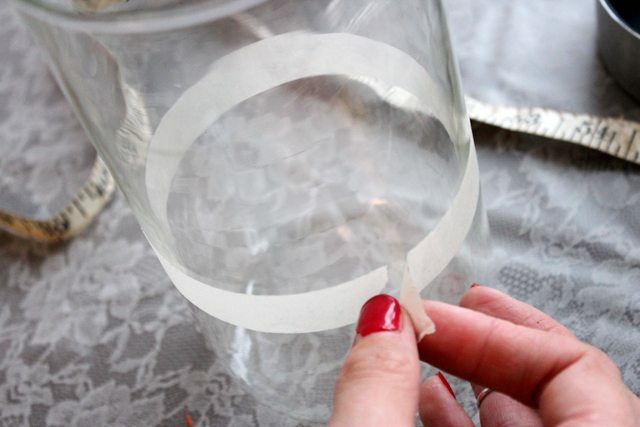 If you’ve ever tried etching glass, it’s kind of a stinky, faulty mess. This, on the other hand, makes the whole thing kind of foolproof. 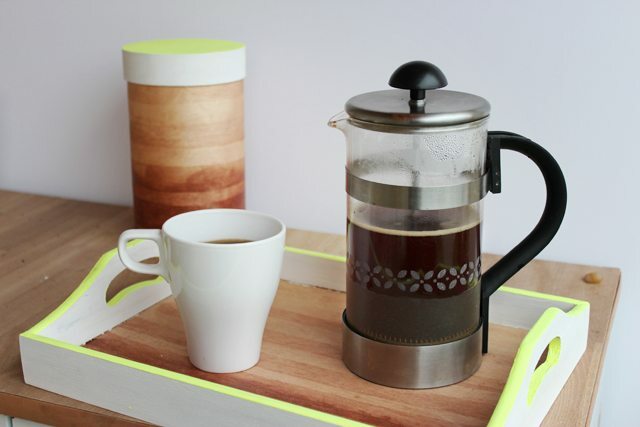 I wanted to refresh my boring, plain Ikea French press coffee pot to go with my cute new coffee tray, and this seemed like the perfect way to go about it. With spray-on frost and adhesive stencils, the process goes really smoothly, and if you wanted a bigger impact, you could absolutely use the opaque glass paint from the line, rather than the translucent frost that I used. P.S. You can find the tutorial for the coffee tray and canister right here. 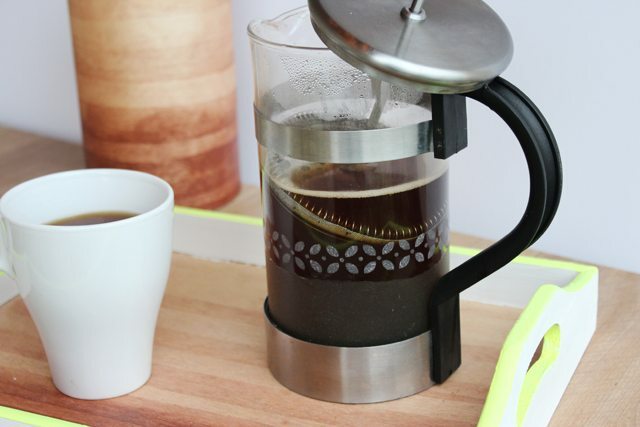 French Press Coffee Pot – Mine’s from Ikea. 1. Your French press will be inside a little metal or plastic frame. 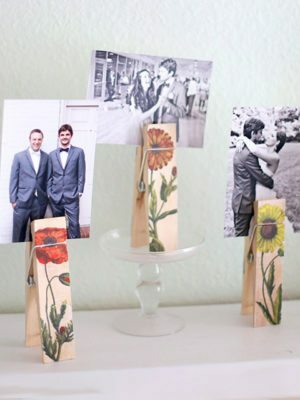 Make a few dots with a permanent marker at the bottom of the top portion of the frame. Now carefully slide the glass carafe out of the frame. 2. 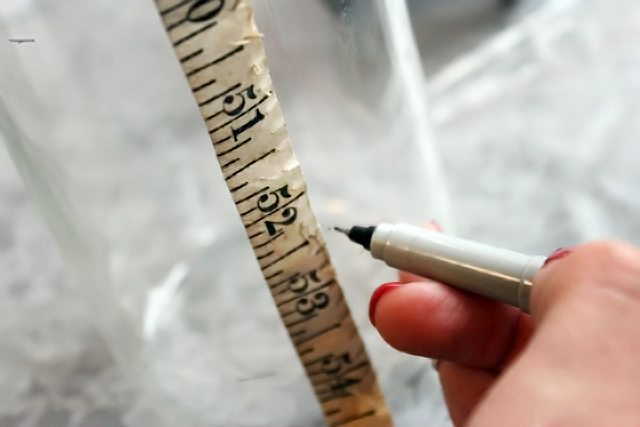 Measure a distance roughly 2/3 from the dots to the base of the carafe. Mark a few dots at that measure around the circumference of the glass. This will help you make a straight line in step four. 3. 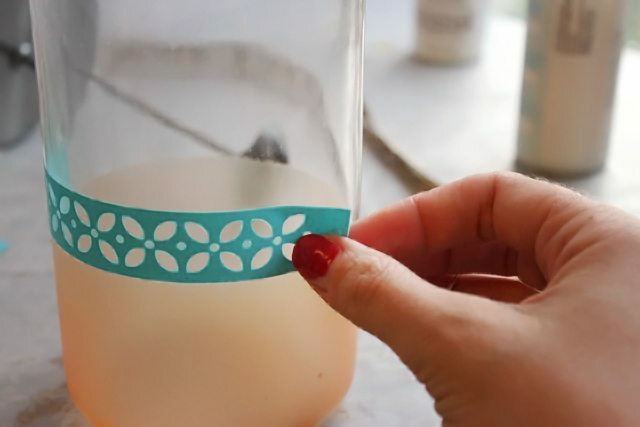 Wrap masking tape around the glass so that it lines up with the dots you marked in step two. You should probably add a couple more layers of tape higher up to protect the glass above the line. 4. Mix the dark color of paint one-to-one with the spray paint mixture, and put the can together according to the directions on the box. Go outside and spray the glass below the tape line. Spray thin, even layers, or you’ll get thick drips. Peel the tape off right away, and then let it dry for awhile. 5. Use the metal stencil tool set to clean up any rough edges or paint drips after it’s dry. Don’t worry – it won’t be set until you’ve cured it in the oven. 6. 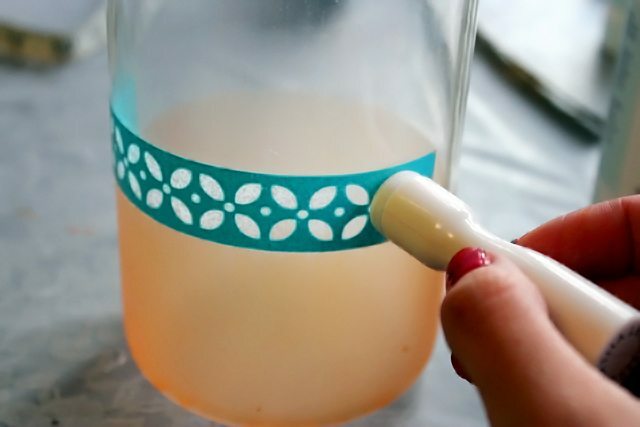 Peel the stencil off the sheet, and stick it onto the carafe so that the bottom line touches the top line of colored paint. 7. 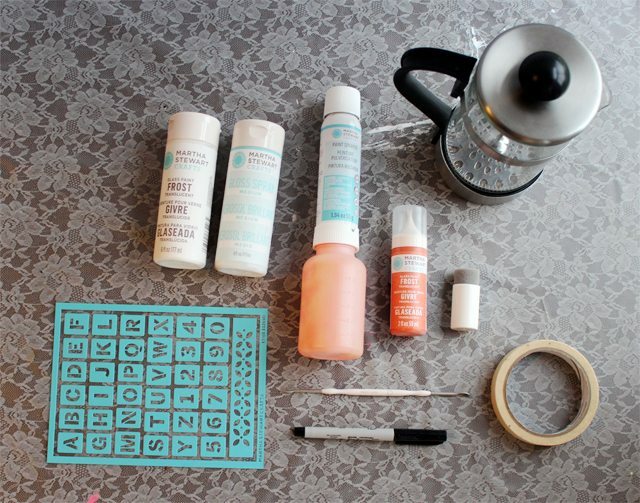 Dip the dauber sponge into your lighter paint, and carefully dab it onto the stencil. Wait a moment, and go back over it once. 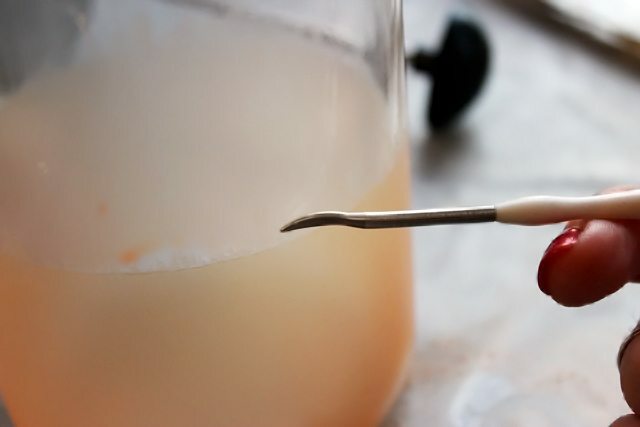 Peel it off right away, line it up to overlap the last ‘flower’ in the first batch, and do it again. Repeat until you’ve finished the full circumference. 8. Wash the stencil right away with water, and stick it back onto the sheet. Put the carafe into a cold oven. Turn it to 350 degrees Fahrenheit, and leave it for 30 minutes. Turn the oven off without opening the door. About an hour later, when the oven’s totally cool, remove the carafe. * Disclosure – This post was sponsored by Plaid Crafts. I received free product and compensation, but the tutorial, photos, and opinions are entirely my own. See my disclosure statement for more information. 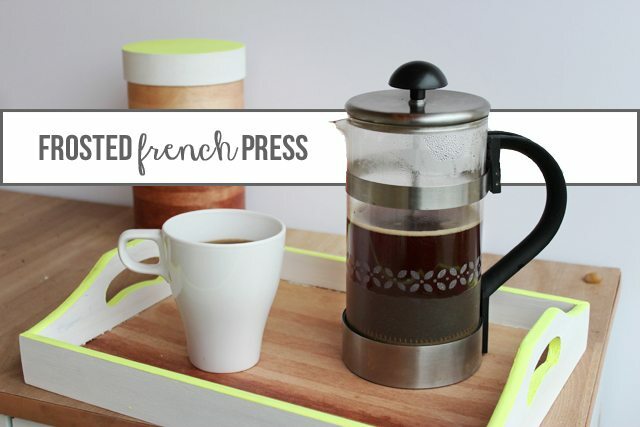 Love the idea of customizing a french press! It’s BEAUTIFUL! And I have to say, my eye immediately went to the neon tray, too. Great job, I had a blast playing with my Martha paints and am loving all the inspiration! Thank you so much for this post. 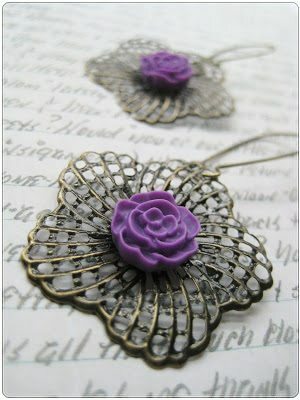 I want to let you know that I posted a link to your blog in Creative Busy Bee Craft Inspirations, under the Page 5 post on Sep. 14, 2012. Thanks again. Such a great idea! Love the personalized touch! 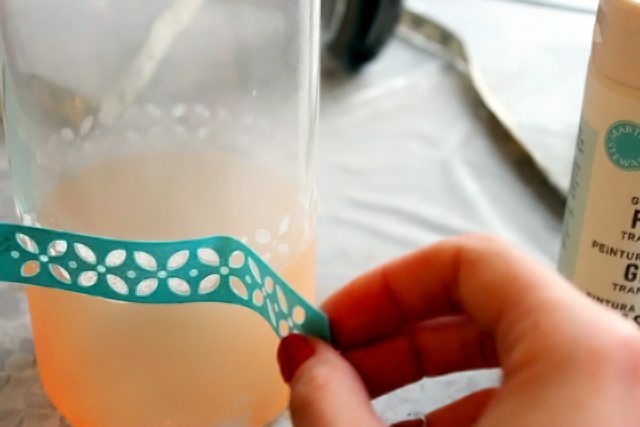 This would be a cute idea if you used etching cream instead of paint, this way it could be put in the dishwasher and wouldn’t scrape off over time. Nikki, Baking it actually cures the paint so that it won’t scrape off. It can be washed in the dishwasher and everything. Hi Lindsay. That is just awesome! It surely looks easy to do. I will give this a try. I’m thinking of etching the different beverage glasses that I have. 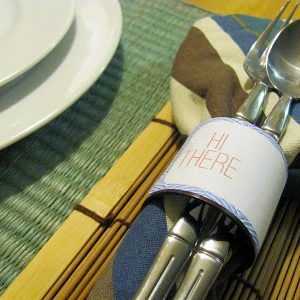 What a great idea to personalize a gift! 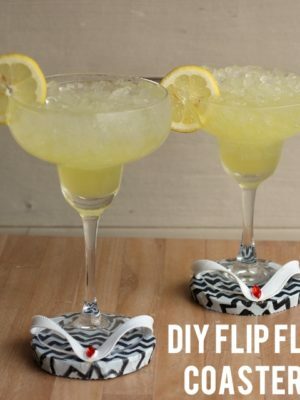 I’m new to your blog, but from what I’ve seen, I can’t wait to try your DIYs! So beautiful — love it! 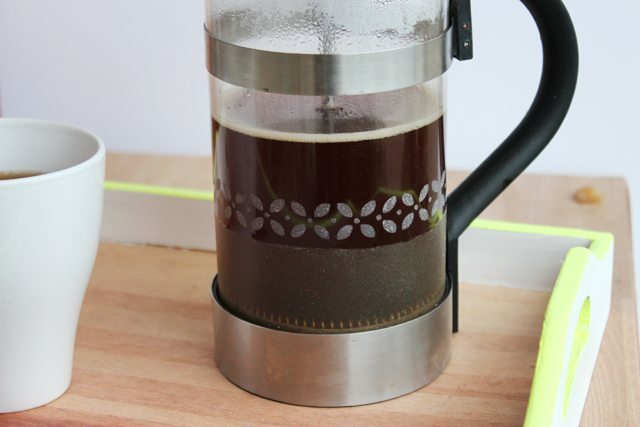 What a fun way to dress up a coffee press! It looks fabulous. 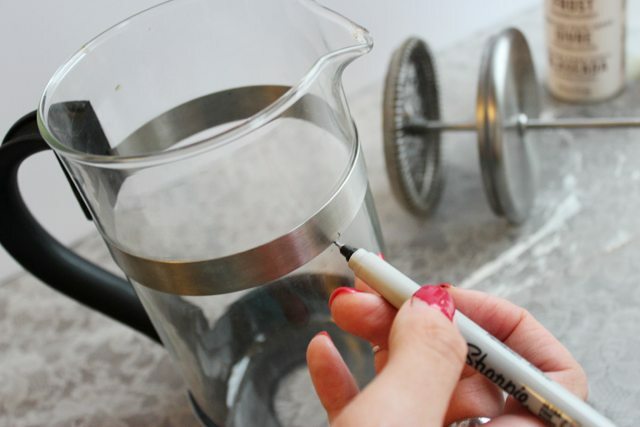 I never would have thought to do that to my french press. And now I think I need to. This looks great, Lindsay! It’s so fun to see how different bloggers utilized the products. My project will be up next week!